Happy Labor Day! I'm not currently in Omaha, and haven't been for quite awhile, but Tapes 'n Tapes have managed to put the song in my head. And this outfit seems fitting for a trip to the hometown of Saddle Creek Records. Photos taken in Denver by my darling Annie, and post written in Wisconsin. I'm in the midwest for the next little while, and hoping the predicted rain brings a bit of a reprieve from the heat. It certainly doesn't feel like September! Hope you're having a fantastic long weekend, America. 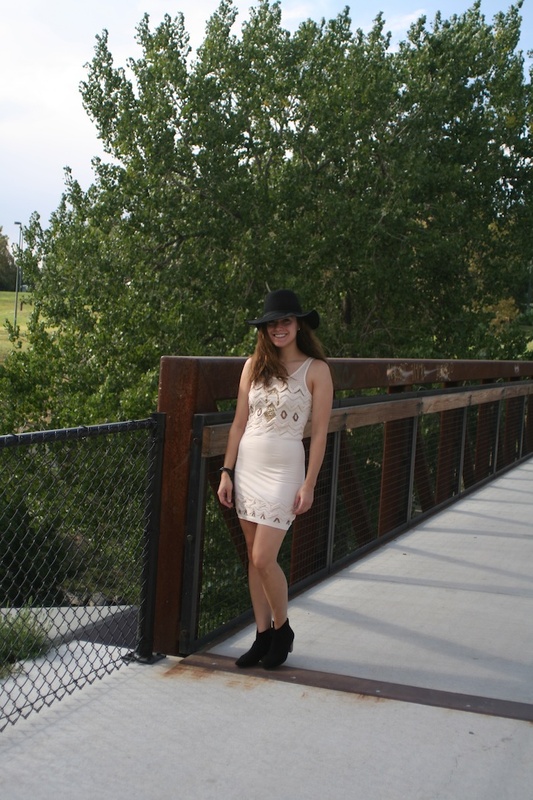 Free People hat and dress (on sale! ), Isabel Marant Dicker boots, Nordstrom bracelet (similar), and Gucci ring via Security Jewelers. You look great! I love your boots. Oh my gosh too cute!! And I love Tapes 'n Tapes! Thank you! Meeeee too, and I keep forgetting how awesome they are! Shame on me, really. Thank you for your comment on my blog dear! !Ok, I start following you, wait for you to do the same! such an amazing dress! you look beautiful as usual! great outfit! love that dress & those boots!